With a varied and complex history, Constantine is one of those characters that if you haven’t been following his mystical adventures on a regular basis over the years, you may find it difficult to click with the character and his odd nuances and quirky character traits. But this new first issue by writer Ming Doyle helps bridge that barrier, giving first time readers all the information they need, and presenting you with a feel for who he is and what he represents, without the need for a complicated explanation of back story. The story itself is absorbing, and very adult, with a nod towards John’s previously hinted at bisexuality. John’s dark and cynical side is brilliantly offset here with a flirty and jovial nature that really draws you into into his crazy psyche. The art is, unique, seemingly at first rather basic, as you read the comic though you begin to appreciate it more, with a real sense of characterisation of both the players and the world itself. My first impression of Riley Rossmo’s style was unfavourable, but it definitely has grown on me now. 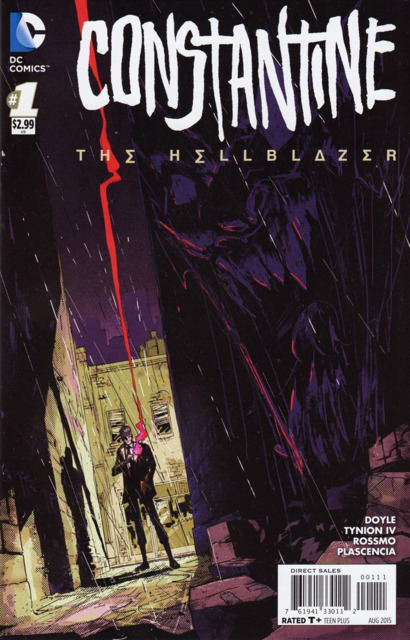 Constantine The Hellblazer #1 can be found at your local comic book emporium right now. Written by: Ming Doyle. Interior and cover art by: Riley Rossmo. Precinct1313 Rating: Awesome, Unusual, Zany, Dark, Adult, but most definitely Constantine… Buy It!